We put the DS1120s through their paces. Are they good? Or are they rubbish? They certainly look good. But do they cut the mustard in the race for high fidelity audio? When it came to giving the Parrot DS1120 Bluetooth speakers a rating, we found it quite hard. Because as speakers they’re not especially brilliant. But what they do have going for them is connectivity. 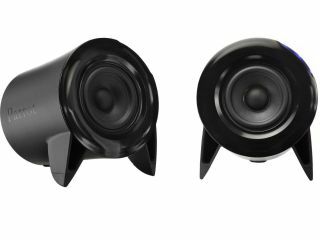 You can synchronize any media-playing Bluetooth device with these speakers and they’ll play your music wirelessly; just like a Bluetooth headset but with a lot more punch. For £160 you’d expect them to be pretty impressive. Especially considering the fact that with most of us now using Bluetooth-equipped phones, the market for Bluetooth peripherals is expanding. So what’s the verdict. Are they a must-buy for this summer?